Lucas 'King of the Road' No 736. 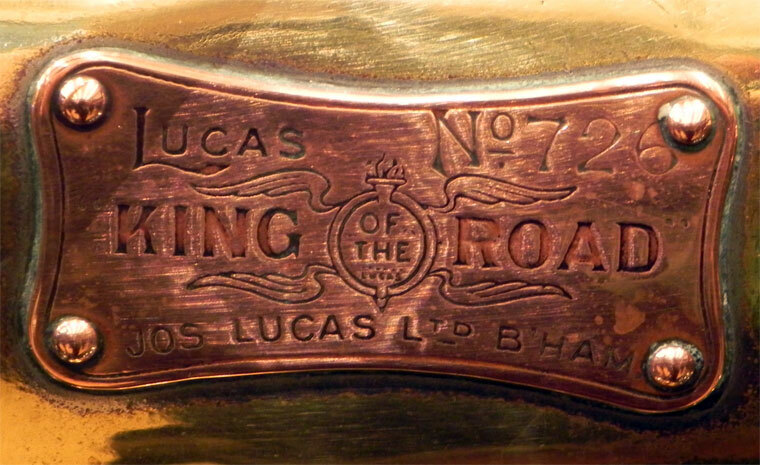 Lucas 'King of the Road' No 736. (Detail). Lucas 'King of the Road' Projector. 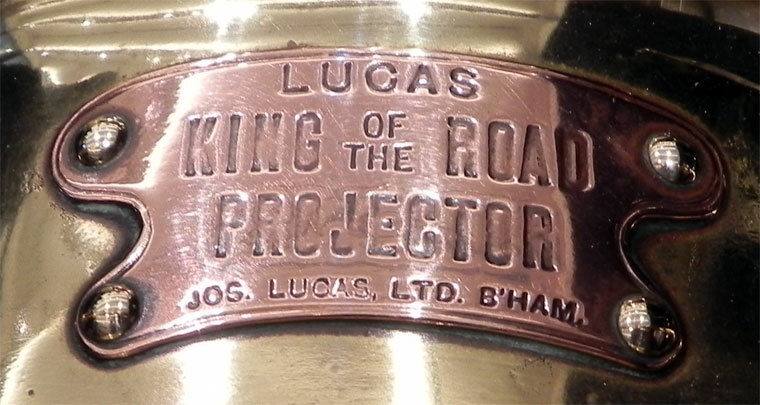 Lucas 'King of the Road' Projector. (Detail). 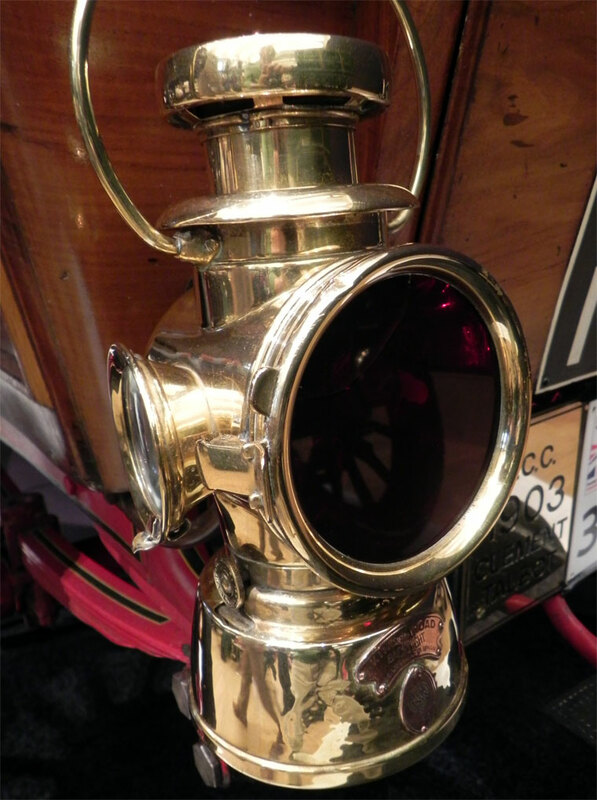 'King of the Road' lamp. Model 721. 1897 A public company, Joseph Lucas Ltd was formed with a nominal share capital of £225,000 to take over the Lucas business. 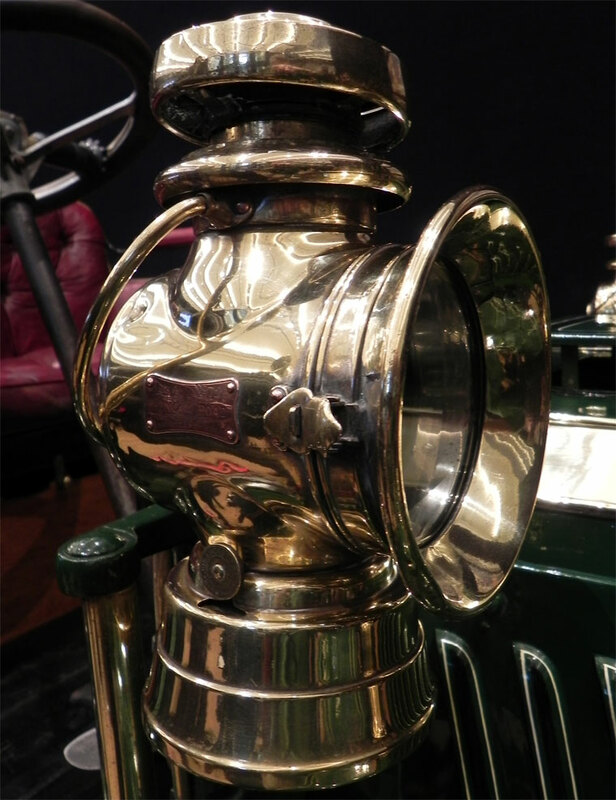 The company was registered on 12 November, to acquire the business of Joseph Lucas and Son, manufacturers of cycle lamps and other accessories. The funds raised finance enabled the company to build a five-storey factory in Great King Street. These motor products were followed a few years later by the company's entry into the electrical field with the manufacture of car batteries and dynamos. 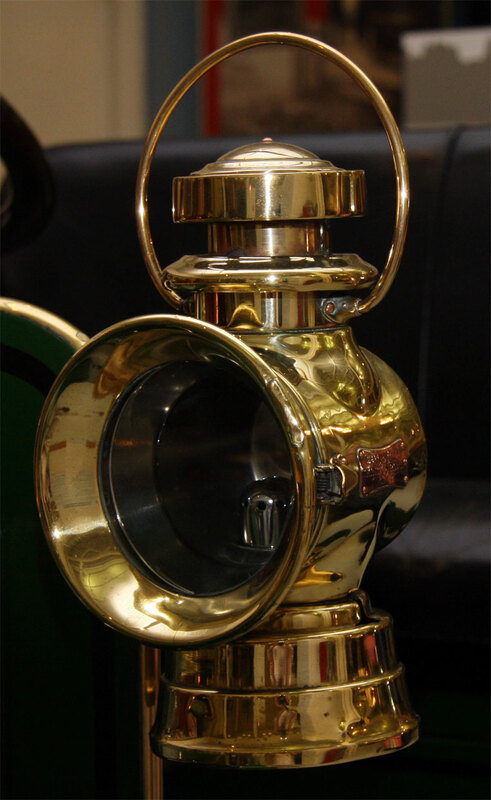 Oil lamp production also began. Other products for the motorist include horns and hydraulic jacks. 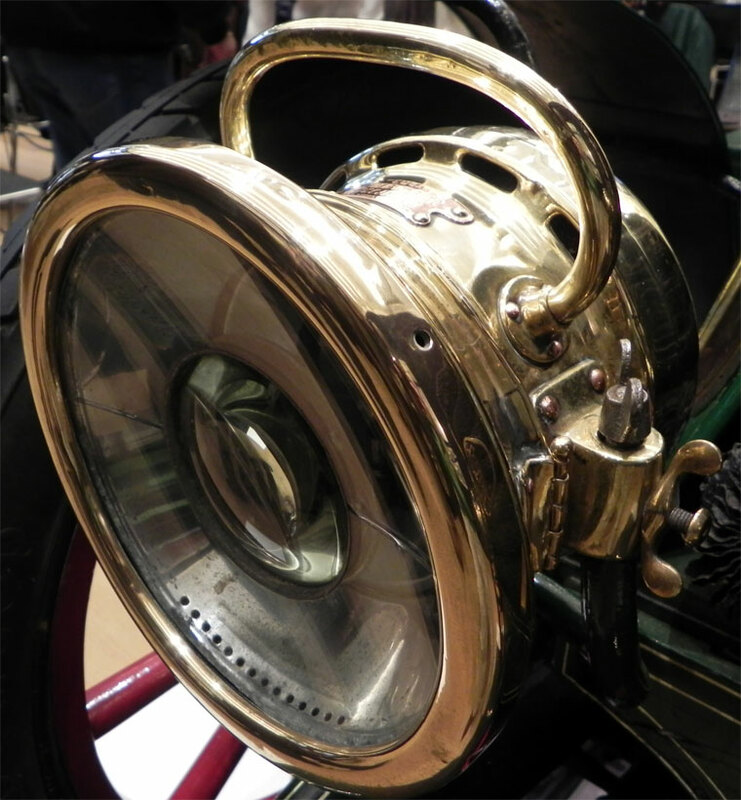 1911 Whole lighting sets were first put on sale for cars, with the dynamo made completely in house. 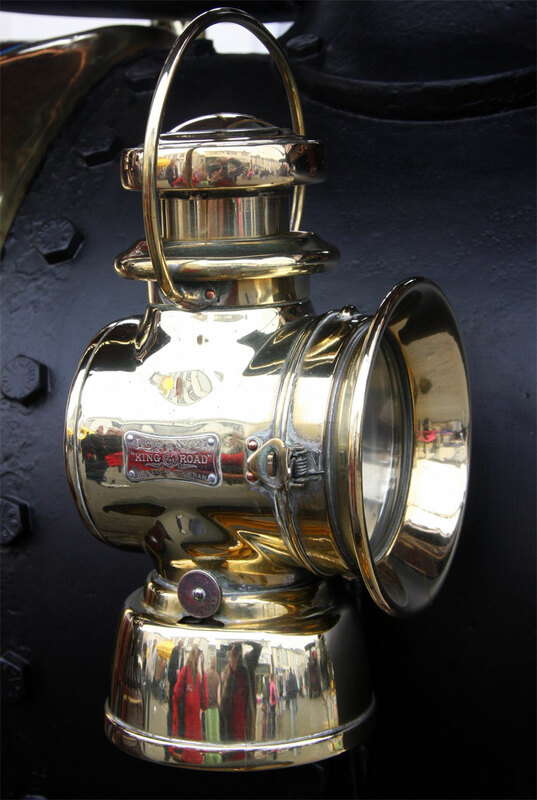 1914 The company started its main growth in 1914 with a bulk order contract to supply Morris with electrical equipment. WWI The company was engaged principally in the manufacture of shells, fuses and electrical equipment for aircraft and military vehicles. 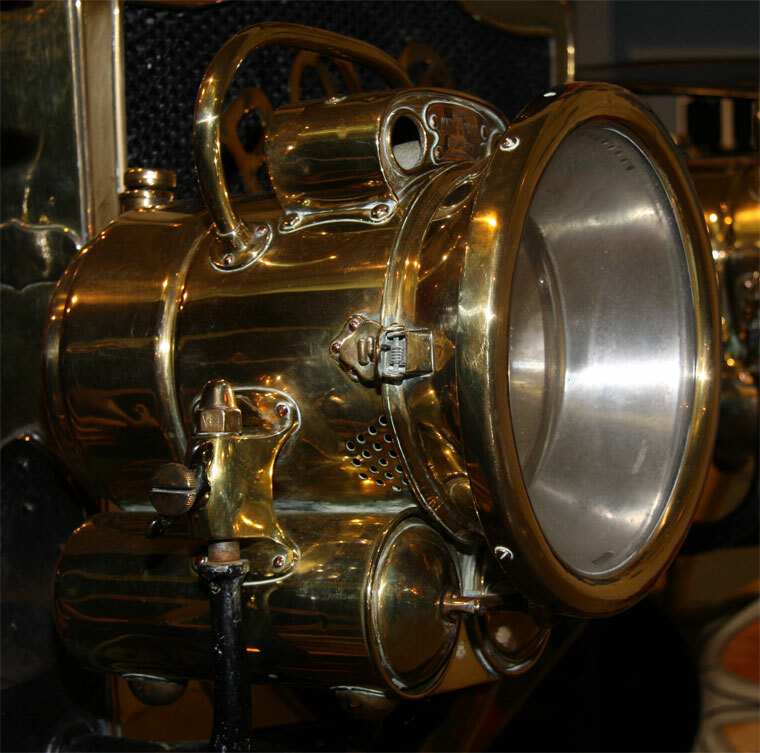 In this period it also began the manufacture of starter motors which had by then been developed in America. From 1923 Bennett and Oliver Lucas, a grandson of the founder of the Lucas business, were Joint Managing Directors of the company. They established close personal relations with the principal vehicle manufacturers and themselves became leading personalities in the motor industry. 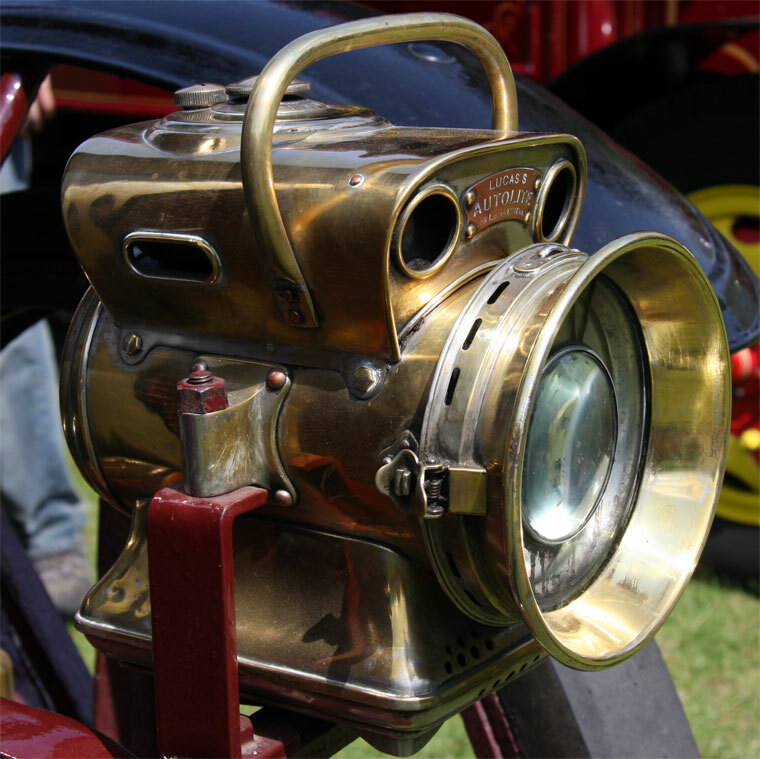 By 1923 over half its output of starting and lighting equipment was supplied to Morris. The value of the Morris business to Lucas is illustrated by the fact that in the four years from 1921 to 1925, Morris's sales of vehicles jumped from 3,000 a year to 55,000. 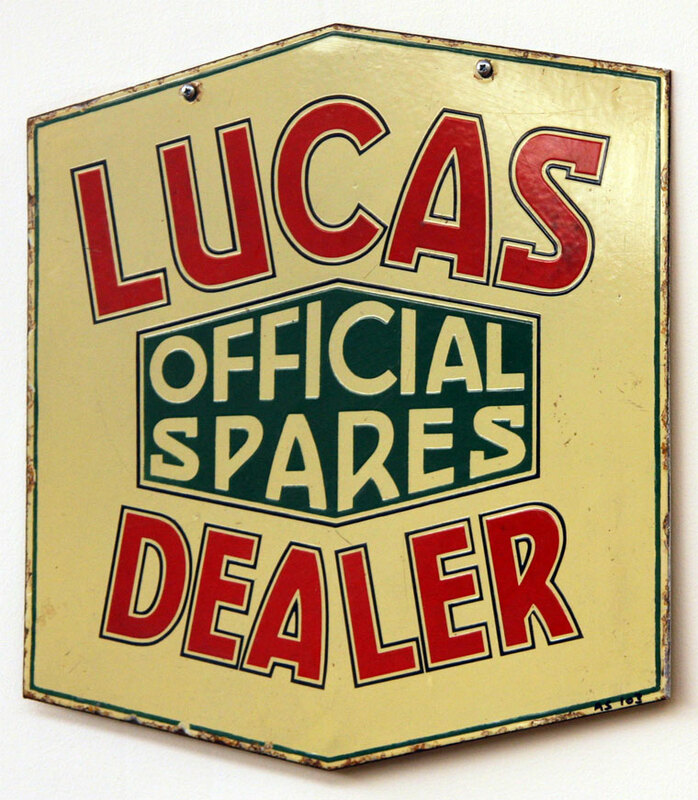 At the same time, however, Lucas was selling in increasing quantities to other manufacturers, including Armstrong Siddeley Motors, Rover, Standard and Triumph, with the result that by 1926 the proportion of Morris business to Lucas's total sales had dropped to about one-third. For the year 1925-26, Lucas's production of starting, lighting and ignition sets for supply as initial equipment averaged 2,000 a week. 1926 Acquired C. A. Vandervell and Co and Rotax Motor Accessories Co, its 2 largest competitors. 1926 Gained an exclusive contract with Austin. 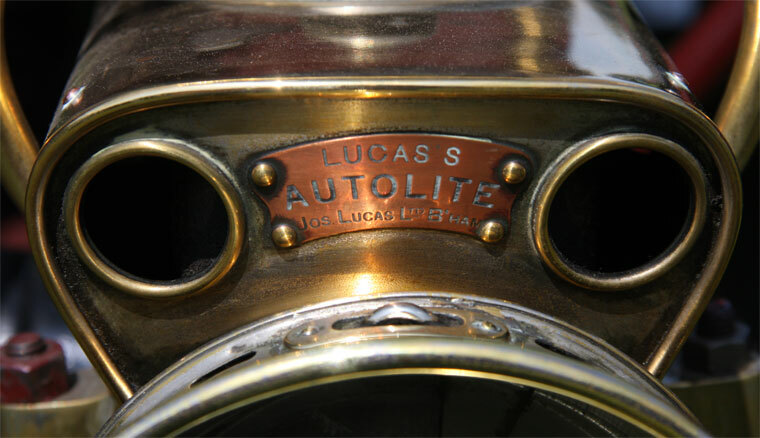 Lucas obtained the contract for the following year for the whole of Austin's requirements of starting, lighting and ignition equipment. 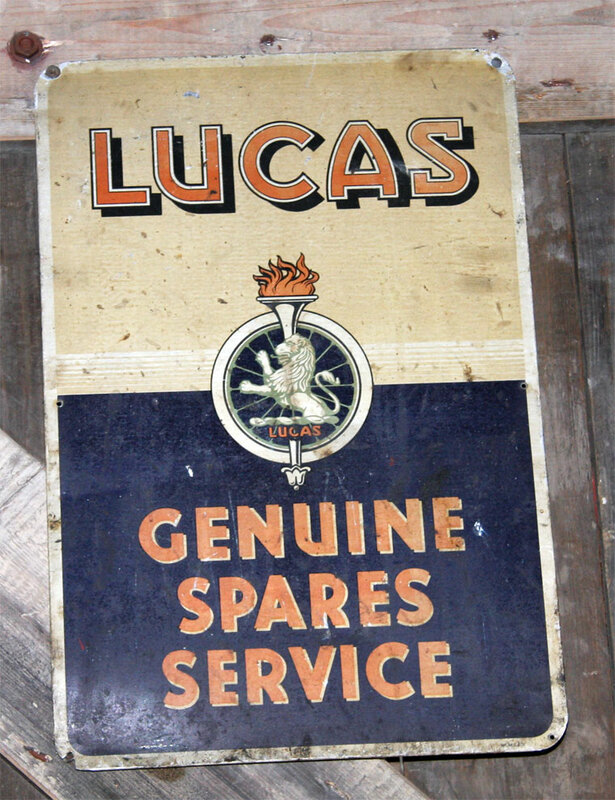 Around 1930, Lucas and Smiths established a trading agreement to avoid competition in each other's markets. 1931 Following a manufacturing and market sharing agreement between Lucas and Robert Bosch A.G., Stuttgart, the well known German manufacturer of electrical equipment for motor vehicles, the name of C. A. Vandervell and Co (in which Bosch had acquired a 49 per cent interest from Lucas) was changed to C.A.V.-Bosch Ltd. By the agreement made in 1931 between Lucas and Bosch the ownership of Bosch Ltd. was transferred to C.A.V.-Bosch Ltd.
1933 With Chloride Electrical Storage Co and Oldham and Son , Lucas set up the British Starter Battery Association. 1937 Acquired Globe and Simpson and the British operations of Bosch. 1938 Manufacture of Girling brakes was taken over by Joseph Lucas Ltd but the patent remained in possession of New Hudson until the rights were, in turn, purchased in 1943. Lucas then moved their Bendix brake and Luvax shock absorber interests into a new division. 1943 Acquired David B. Irvine (Edinburgh) and Girling brakes, which absorbed the Bendix and Luvax operations. 1954 Lucas sold Bosch Ltd back to the German parent Bosch for the sum of £25,000. Joseph Lucas (Gas Turbine Equipment) Ltd. of Birmingham and Burnley, England. Lucas-Rotax Ltd. of Toronto and Montreal, Canada. Lucas-Rotax (Australia) pty. Ltd. of Melbourne and Sydney, Australia. 1957 In addition, Lucas acquired a 50 per cent, interest in Siba Electric. 1972 Centenary of company. Now employed 100,000 persons with 60 manufacturing and distribution companies. 1981 Chloride and Lucas form a joint venture reinforced with substantial government funds. The company was called Lucas Chloride EV Systems. 1982 Due to a plummeting demand in America for Lucas CAV's Microjector, its US Greenville plant shut down completely for 10 weeks putting 240 production and support workers out of work. Lucas Electrical Electronics and Systems. 1999 LucasVarity was acquired by TRW, an American company. This page was last edited on 9 December 2018, at 12:24.